So you've decided to stop eating so much white bread and sugar, and as a result, you've dropped a couple of pounds. You're feeling good, and you're increasingly confident about your body and yourself. Now what if national newspapers publish in-depth examinations about what your weight loss means? Are you still feeling confident and excited? I ask because this is exactly what happened to Jeb Bush; if you haven't heard, in recent months, Jeb Bush has lost some weight. This is as a result of the Paleo diet, whose followers don't consume anything that a caveman supposedly wouldn't have eaten. That means you basically adhere to a very simple diet of fruit and vegetables and meat — no processed bread products or ice cream. Bush's dedication to the diet means he has lost about 30 pounds since December. But since he is a public figure, and a presidential candidate at that, it also means a bunch of people have reported on his body changes, even implying that his weight loss has some meaningful implication for his political aspirations. I am all for healthy eating, and it is great that Bush has so many (apparent) supporters. But I feel compelled to ask: why does it matter? Why is one man's weight loss national news? How can this kind of weight fixation be appropriate? One easily accessible approach is always the Hillary side of things — WWHD? In this case, would we think if was OK if Hillary Clinton's (hypothetical) weight loss were covered in this way? I can't imagine that we would accept that. More and more, people are recognizing that focus on a woman's body as her most important defining factor is not acceptable, especially if that woman has serious intellectual aspirations. Why should a man's body be any different? The headlines about Bush's weight loss are troubling, to say the least, as they represent a bizarre combination of humor and seriousness. The New York Times ran a front-page piece with the headline, "Jeb Bush Is Definitely, Grumpily Running... Away From Calories." In addition to detailed information about Bush's refusal of pasta at restaurants, the story went into depth about his exercise regime. Though the minutiae of celebrities' lives have always been fodder for popular gossip and conversation, it is hard to imagine what bearing this information could possibly have on a section labeled "Politics." It is also worth noting that Bush has declined to comment on his weight loss. Doesn't his silence say something? Perpetually starving to death apparently is the source of losing weight. Either Bush is making light of those who are genuinely starving, or he is facing real problems with his diet. Such rapid weight loss may be taking a toll on his body and mind, as the grumpiness that The Times noted may indicate. USA Today ran a piece entitled, "Weighing Clues about 2016 By Looking At The Scales," whose implications are self-explanatory. This headline is humorous, in a way, in that it uses wordplay much like The Times did in their article. But it also indicates a special seriousness that must be adopted when talking about someone's body. The discussion of physical appearance is to be taken seriously — so seriously that it could indicate someone's life ambitions. 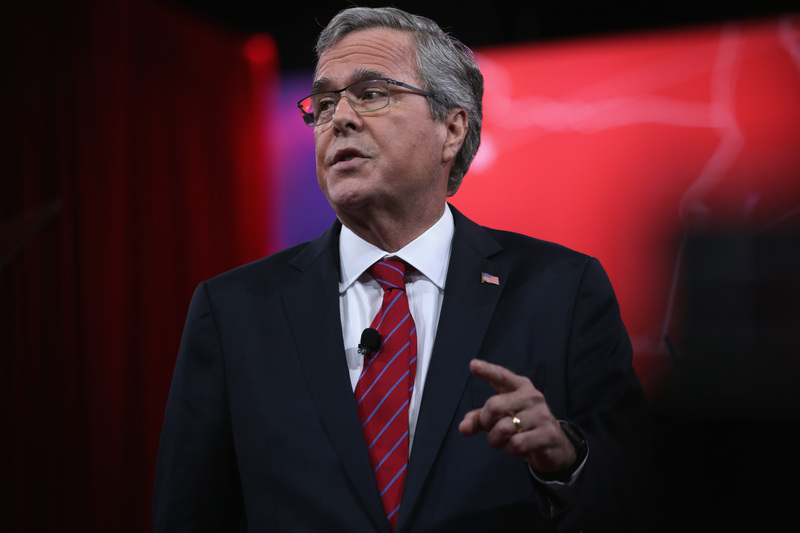 Others have speculated about what Bush's weight loss means about his potential presidential campaign. Some say his change of diet will alienate him from the public, as it means he's not really "American" anymore. Jeb needs to appeal to red state Americans without seeming like kale-eating, composting, Subaru-driving treehugger. Jeb needs to be American, dammit. But what does that even mean anymore? He needs to be approachable, the nice old guy from Midland, Texas—not the guy listening to Michelle Obama's gardening advice. And yet, maybe that's who Jeb wants to be. Maybe that's who he is. One Miami Herald article listed Bush's weight loss as one of five signs of his ambition to run for president. A trimmer physique makes it easier to walk. And run for president. In today’s cruel spotlight of high-definition TV, thin is more in than ever. At first, I objected to the assumption that the "thin is in" mentality should define someone's life goals. But then, the reporter writes, Bush said something odd. Bush opened his blue suit jacket and looked at his waist. “I’m going to need to lose a lot more weight if I run for president,” Bush chuckled before ducking into his office. I may reading too much into it, but then again, this response seems quite revealing. What makes Bush think being thin is a requirement to hold office? Could it be, perhaps, the media's incessant focus on his body — one that we, as a society, would chastise were it targeted at a woman? As U.S. News put it, the details of Bush's changing body are not only irrelevant, but bizarre and misleading. The narrative tempts us to believe that we’re learning something not just about the candidates’ physical fitness, but about their fitness for office. Yet waistline watchdogging doesn’t tell us anything. Calorie counting doesn’t correlate with character, and leanness isn’t a proxy for leadership. If leanness were a prerequisite for leadership, we might never have had Theodore Roosevelt for president, or Franklin Delano Roosevelt for that matter. I don't mean to say that Bush is on a plane with these two legendary figures, but he should at least have a chance. Our sphere of leadership would become quite limited if we based bravery on BMI.